Aggies Do It Better: Scratch Nail Wraps Review! Hey guys! 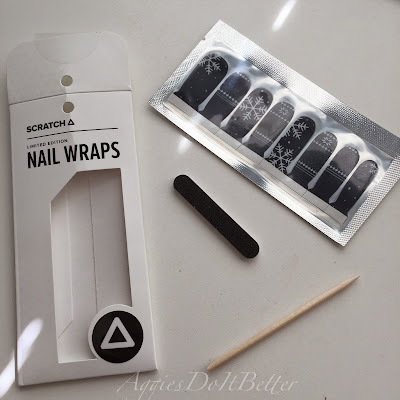 Today I have a review of some super cute nail wraps Scratch sent me! I feel like I've had these forever, they came right in the middle of when the Mr. was traveling a lot! But I finally have the up! 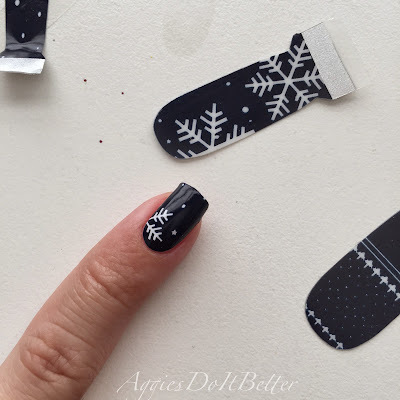 These are the second nail wraps I've reviewed and my thoughts on these are quite different than the first! Click Read More after the collage! Ok! 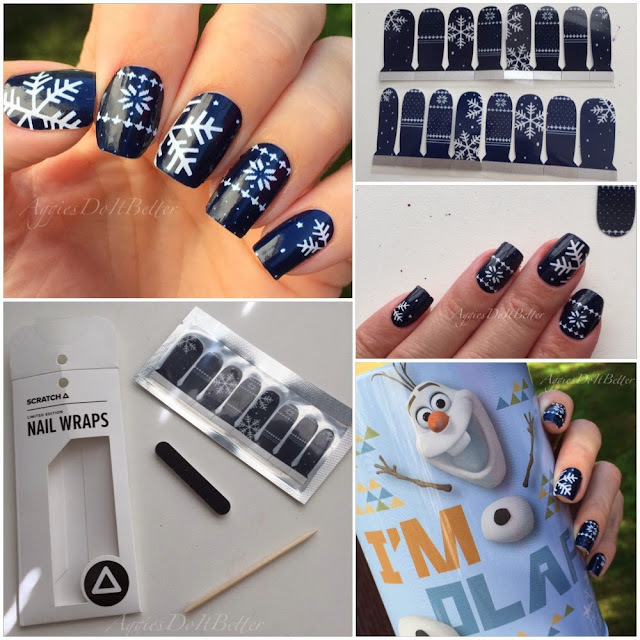 So these are the "Total Flake" wraps by Scratch and here is the direct link for them! I take a lot of pictures when I review things because I know I like to see a lot of pictures when I read other reviews so hopefully they will help! ;) When the people of Scratch asked me which ones I would like, I chose these and one other design, and these are the ones they sent me! 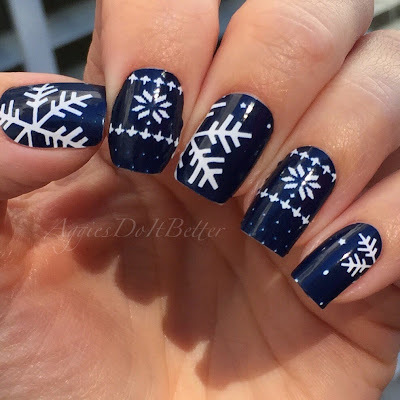 I chose these because I'm completely helpless at drawing snowflakes, even though I love them. 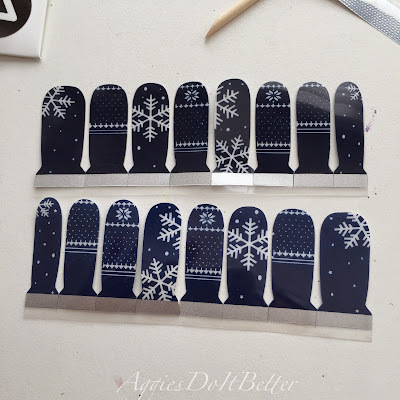 And I don' have any stamping supplies, and this a very popular stamping design in the winter! Here is the packaging. The wraps come in a sealed pouch, plus a little file and orange stick. I chose the darker ones to start with. There's no instructions included, but a link to the website to see the instructions. I tried to do it with out, but I needed to look any ways (doh). First I started by finding strips that matched my nail width. I thought it might be easier to separate them all. 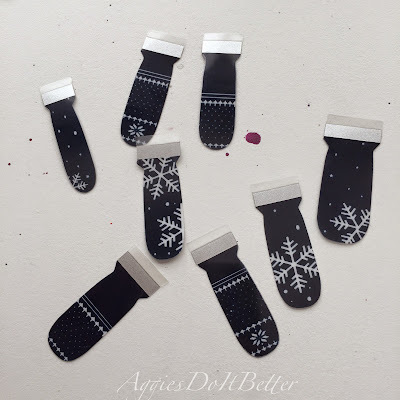 You can cut them or gently rip them. Once you have selected, peel off the clear backing, then there is a clear.....fronting? I don't know the term! 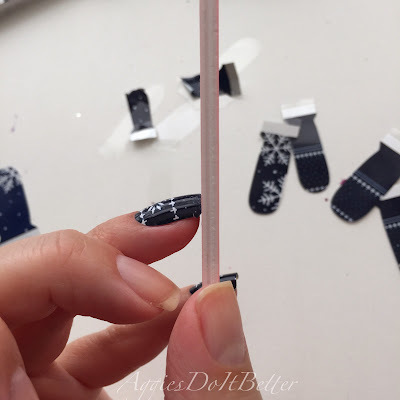 There are 2 ways you can trim the length once you press it down on your nail. I tried both ways. First I pulled it down and filed the end off. I didn't get that smooth of an edge. 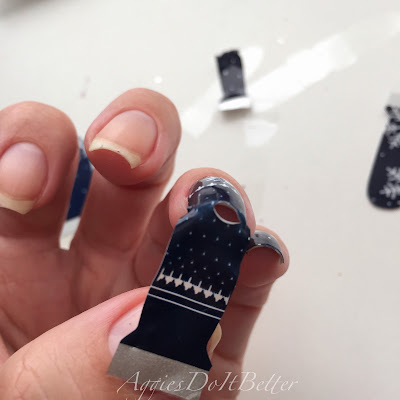 You can also trim the edge and then file it down. On the next one I did the other way, according to the instructions. (p.s. these are muuuuuchhhh thinner and more flexible than the nail wraps I've used in the past) They are self adhesive and you can peel them off and readjust them as needed, but I wouldn't do it more than once or twice. 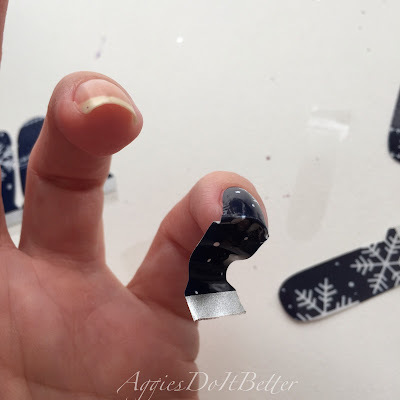 This time after I smoothed it down on my nail I pulled it down and it begins to rip mostly flush with the end of your nail. I use a fine file to smooth down the edge, filing from top to bottom. I found that this method worked way better! 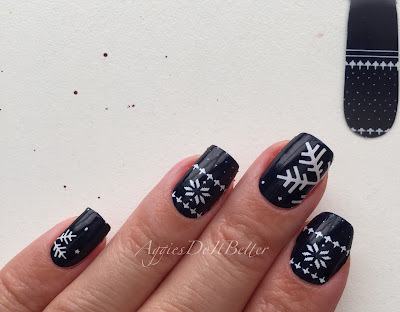 props to my left hand for holding the file to show the angle! haha! And there we go! All done! 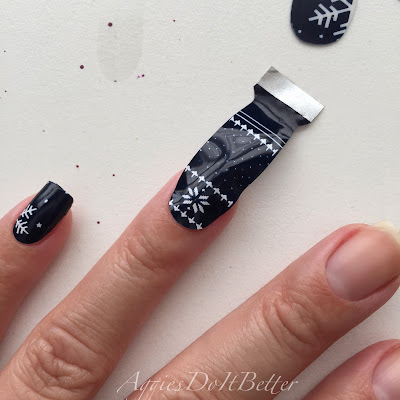 I did not use the orange stick very much to smooth them, when I did it started to tear the wrap so I mostly just used my fingers to smooth them down. To remove just use polish remover! 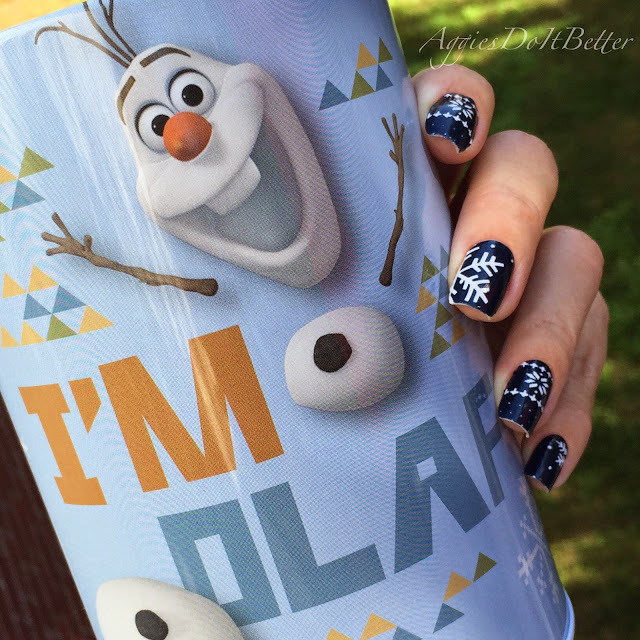 I couldn't resist taking a pic of these with my Olaf bank/canister one of my boys got me for my birthday last week. I have a deep love for Olaf and everyone knows it! 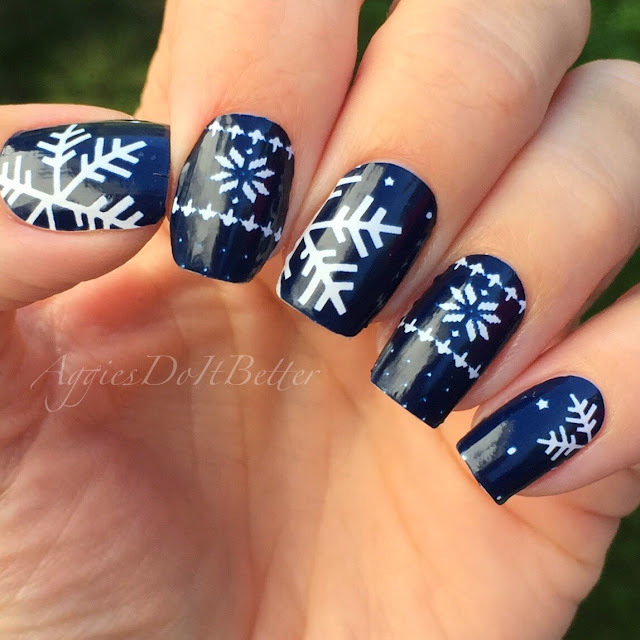 How cute is that!